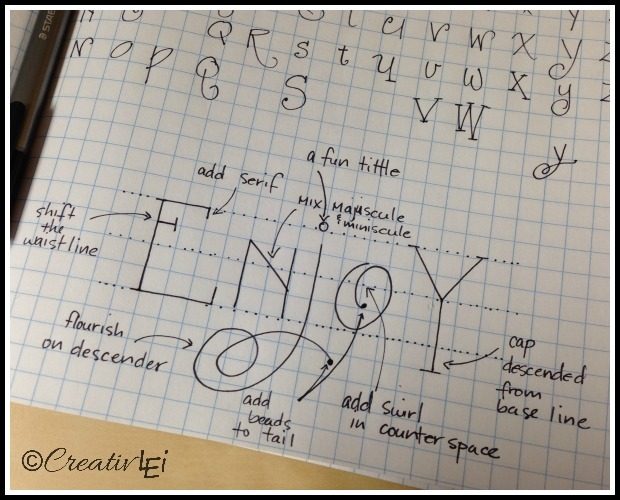 Ready to bend the handwriting rules a little further to create whimsical lettering? You all did great with altering your letter styles yesterday, with simple changes to the bowls or slant of the letters. Today we’ll add a touch of whimsy. This is just one more small step towards creative lettering. I also like to add serifs to some letters, or mix italic and basic print. Allowing the cap height and ascenders to stagger over or just under the cap line, keeps it interesting. I often add beads (or dots) to the tails of letters, also known as finials or terminals. Mixing uppercase (majuscule) and lowercase (minuscule) looks random, but actually is methodical and can be done without effecting the readability. You want to create rhythm, not confusion. Some letters lend themselves to lots of opportunities for little additions. Fill a page or two playing with different styles of print and/or italic letters. Try a couple of words mixing features. Don’t worry if the words don’t look like they do in your mind’s eye, this assignment is about experimenting. If you’re just stumbling upon this series, welcome! Here is the introduction where recommended supplies are listed. 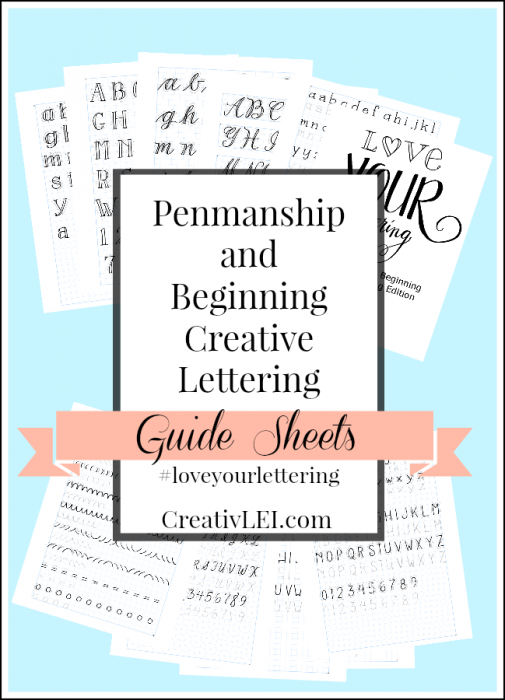 They aren’t all necessary to start, but if you love lettering, these will be very helpful additions. Can I just say that I’m loving this? I have nerve damage in my hands, and I’ve found handwriting so difficult and painful. My hands start to cramp up after writing for just a little bit. But I found this and I loved art pre-nerve damage, so I’m choosing this as my own personal therapy. And it is awesome because it is fun and with a purpose, not just repetitive. 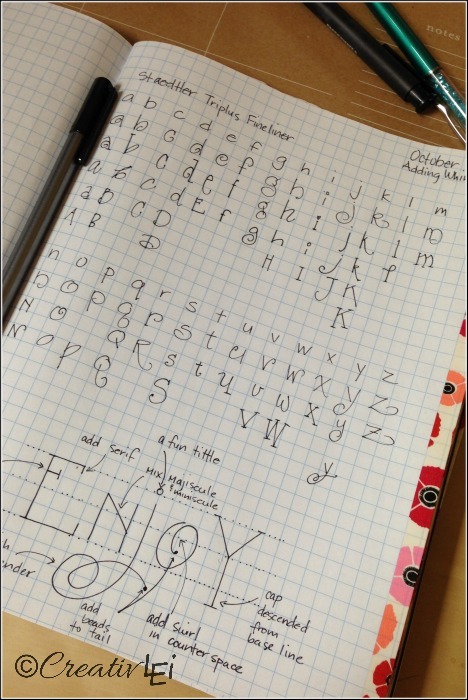 I did an extra page of just fun words today after a break of doing my alphabets. It is fun to play and I’m finding I can write the alphabet more times before needing a break already! Amber, that is awesome news. I’m so glad this could be both fun and helpful! Thanks for joining us! So I was thinking a glossary of lettering terms would be helpful for me. 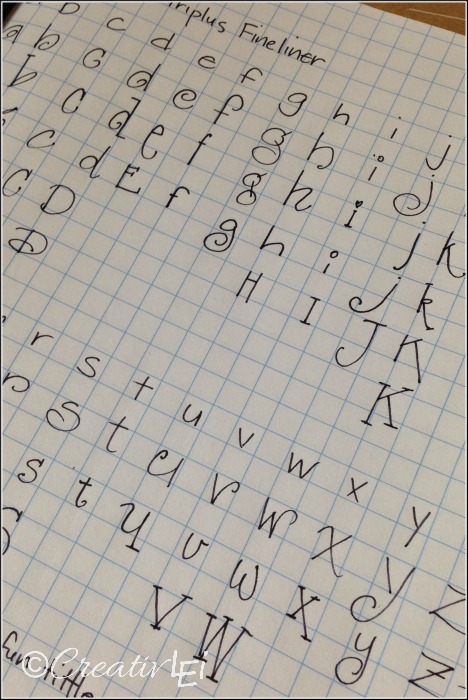 I googled “lettering glossary” and quickly got overwhelmed! Can you recommend one with just the basics we will be using in this course? I’m going to think on that and see what I can put together. Great suggestion, Carey. I really want to make my own font. This is so cool! Thanks for such a detailed piece, I feel like I learned a lot. I’m totally joining this challenge. I started on Jan 19th and just now getting to day 7! I have loved working through this series. My penmanship alphas really improved as well. I have found it helpful to keep a stack of large index cards next to me for additional practice. My daughter (17) now wants to go through your lettering series. She has beautiful penmanship and it would only get better. Thanks so much for sharing! Lisa! I’ve been looking for something fun like this! I’ve always had great handwriting, but that can work against me when I want to do something creative with lettering. I always want to write perfectly, (Such a prissy attitude, right? 😄) I’m ready to branch out and throw caution to the wind. 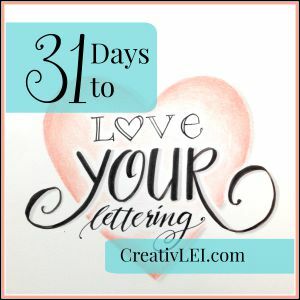 I’m excited to have found you and your wonderful, creative lettering! I’m in! Karen, I’m so excited you’ve found me. I’m a recovering-ish perfectionist, so I get it! Moving into a bit of whimsy has taken me quite a while, but I am learning to let go and find my inner fun-girl. Can’t wait to get to know you more. This is addicting!! I love it! (I know…I’m almost a year late to the party!) I couldn’t be a worse artist if I were a penguin with a broken wing and my regular handwriting (especially rushed) is so embarrassingly bad! I have always said having better handwriting was the thing I would change about myself if I could only change one thing. I have NO confidence in my “artistic abilities” but I’m actually picking some things up and I’m not totally embarrassed to show it?! This is unheard of! Thank you!! Emily, thank you so much for your kind words! I’m so glad you’re enjoying the process. 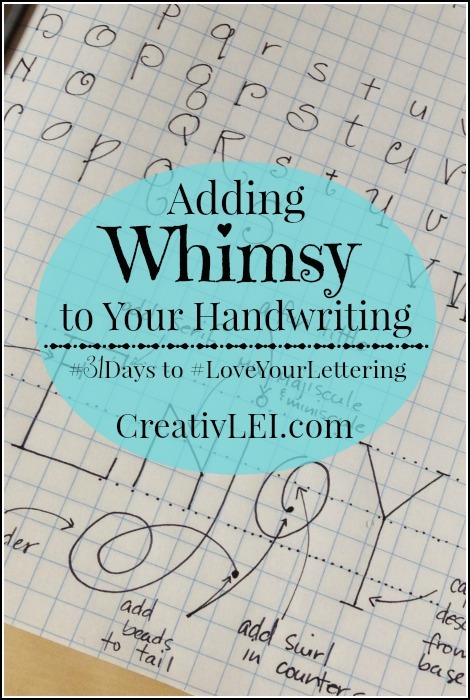 I think there is some freedom when you look at penmanship as a drill and discipline that doesn’t rely solely on artistic capacity… because when you let go of the ‘need’ to be artistic your hidden creativity comes to the surface. 😉 Happy to have you here! Hi Jill, thanks for asking. I will work on adding a full-sheet photo to the post. I am currently writing the eBook to accompany this series that will include full exemplars and stroke instructions. Thank you so much for your feedback and encouragement.